This sea glass necklace shines with rich jewel tones you won’t typically find on the beach. 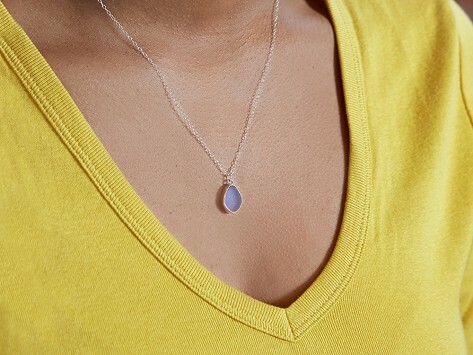 A handcrafted coloring process makes the white sea glass in the pendant give the impression of deeply saturated color and results in an eye-catching accessory. Handcrafted in South Carolina with sterling silver and sea glass sourced from Puerto Rico. Care: Use a silver polishing cloth on silver for a bright shine as needed.